HFO-1234YF is a new automotive refrigerant product originally developed by DuPont and Honeywell that provides several advantages for automotive air conditioning systems. Read on to learn the 10 most important things about this new refrigerant option and how it is poised to change the automotive air conditioning industry. Refrigerant Depot specializes in the Honeywell HFO-1234YF product for automotive dealerships and collision shops. 1. Honeywell Refrigerant HFO-1234yf is a hydrofluoro-olefin refrigerant. HFO-1234yf is a refrigerant that has a different chemical composition than traditional refrigerants used in automotive air conditioning. It is considered a hydrofluoro-olefin refrigerant. 2. 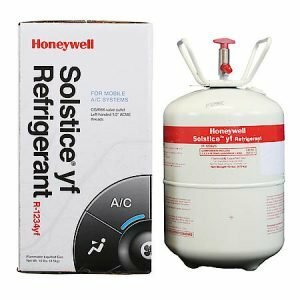 Honeywell HFO-1234yf is different from traditional refrigerants. This new hydrofluoro-olefin refrigerant has a different chemical makeup than the hydrofluorocarbon refrigerant that is traditionally used in automotive air conditioners. Honeywell HFO-1234yf is made up of hydrogen, carbon and fluorine, the same chemical components as the traditional coolants. However, Honeywell Refrigerant HFO-1234yf includes a double bond between carbon atoms instead of the single bond seen in hydrofluorocarbon refrigerants, like HFC-134a. 3. This product is necessary for repair shops. This new refrigerant is fast becoming the standard for automotive air conditioners because the major automakers have made it that way. Almost all of the major automakers now use this in automotive air conditioning systems, and those who do not currently use it are planning to start using it within the next few years. 4. HFO-1234yf is popular in Europe and is expanding to the United States. Currently, Honeywell Refrigerant HFO-1234yf is most popular in Europe. Automakers started using the refrigerant in European vehicles several years ago. A law implemented in June 2011 made it necessary to use this type of refrigerant to reduce emissions and combat global warming. 5. This product helps meet the standards of CAFE regulations. In the United States, the Corporate Average Fuel Economy (CAFE) requirements regulate emissions and give automakers valuable tax credits for meeting standards. Replacing R-134a systems with a HFO-1234yf system is one easy way for automakers to achieve this. 6. Is there a difference in performance between HFO-1234yf and R134a? While HFO-1234yf is considered better for the environment, it is classified as slightly flammable. Otherwise, the two refrigerants are very similar in performance. While R134a could be put into a HFO-1234yf vehicle system, it is not advisable. 7. The 1234yf product is better for the environment. Environmental studies show that R134a and older refrigerants contribute to global warming. The new Honeywell refrigerant reduces the level of emissions that the vehicle puts into the environment, making it preferable to governments and environmental activists. 8. Top automotive makers are already using Honeywell Refrigerant HFO-1234yf. Chevrolet, Chrysler, BMW, Dodge, Kia, Jeep, Honda, Volkswagen, and many other automakers are using this refrigerant in many of their vehicles. 9. Honeywell Refrigerant HFO-1234yf has a higher initial investment. This new refrigerant will be more costly than the types traditionally used in vehicles, but this is considered a small price to pay to reduce global warming. Refrigerant Depot is proud to offer deep discounts to dealerships and on large orders. 10. This product requires a new A/C system. To work on vehicles that use the the new refrigerant, a repair shop needs to have a new system installed. To get started on ordering a new system for your shop, contact us today.